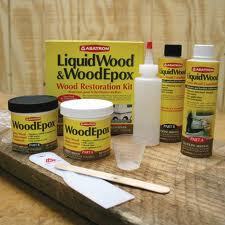 This kit conveniently packages together equal volumes of LiquidWood® A and B, WoodEpox® A and B.
LiquidWood is a deep penetrating wood consolidant that regenerates and waterproofs rotted, dried-out or spongy wood. It restores structural strength and durability to wood fibers. WoodEpox is a shrink-free wood replacement compound that can be used in any thickness to replace and repair wood. It can be painted, stained, sanded and worked like wood. Uses: Use on windowsills and frames, columns, doors, moldings, clapboards, balustrades, furniture and anywhere wood is in need of strengthening and repair. The products are easy to use. LiquidWood and WoodEpox are 100% epoxy and contain no VOCs or water. LiquidWood and WoodEpox are GreenGuard® Certified for low, non-toxic emissions. Includes: 6 oz. LiquidWood A, 6 oz LiquidWood B, 6 oz. WoodEpox A, 6 oz WoodEpox B, applicator bottle, gloves, putty knife, 1 oz. measure and tips and instructions.